This is one of the greatest sociological paradoxes: what we call race is an imaginary social construction and at the same time one of the most powerful forces shaping American lives. Geneticists tell us that the commonalities of individual DNA run extremely high, that the characteristics we use to distinguish what we call race are widely distributive phenomenon. In short, race does not exist as a biological marker. Race certainly exists as a social marker. It matters in a wide range of social dynamics, from criminal justice to schooling to employment to lifespan. Those social dynamics can be seen in differential rates of educational completion, of median income, of incarceration. Such data is readily available to anyone who will look. The statistics depend on what we sociologists call The Ecological Fallacy — extrapolating from aggregated data to make sense of individual behavior. They call us to look for policy solutions without understanding how those social dynamics play out on the ground. In May of 2014, Ta-nehisi Coates wrote a masterful work in The Atlantic laying out The Case for Reparations. In that 15,000 word article, he described the legacies of slavery, Jim Crow, housing policy, criminal justice policy, and much more. His work has been supplemented by a host of others, especially since the Baltimore protests, that illustrate the imbedded nature of inequality into our taken-for-granted life in America. 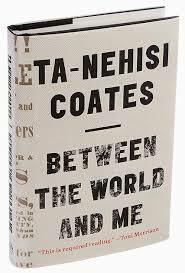 Now Coates has supplemented that structural work with a very personal view in his new book, Between the World and Me. Written as testimony to his then-15-year-old son Samori, it describes how Coates attempted to navigate the terrain of race in America. The title refers to the gulf that exists between the world he saw on television — of boys trading baseball cards and playing with cars in nice suburban houses — with his own reality growing up. The book appropriately uncovers that fictions of race. I am, as he frequently writes, one-who-thinks-I-am-white. But Coates reminds me regularly that I am not. I am a member of the species homo-sapien and the fact that I have less melatonin than others does not change my connection to them. To exert privilege based on race I must pretend that race exists in an ontological sense. The structural inequality that is present in society requires us to regularly affirm that fiction. But all our phrasing— race relations, racial chasm, racial justice, racial profiling, white privilege, even white supremacy— serves to obscure that racism is a visceral experience, that it dislodges brains, blocks airways, rips muscle, extracts organs, cracks bones, breaks teeth. You must never look away from this. You must always remember that the sociology, the history, the economics, the graphs, the charts, the regressions all land, with great violence, upon the body. This bodily reality of one’s social location is daunting. Coates writes of how to behave on his boyhood streets of Baltimore with tough kids, of how to hold his body in school to show acquiescence, of how to protect his body against authority figures, of how to experience discipline in his home. All of them impact, limit, and threaten to harm the body. Such a visceral reality is as far removed from my experience as those baseball card traders Coates saw on commercials were from his. The reality of real bodily risk as historical fact and always potential present is what drew Coates to Malcom for inspiration. The “arc of the moral universe is long and bends toward justice” doesn’t work for Coates. In part, this may be as result of his atheism which makes such grand hope just too idealistic. But as he said on Charlie Rose shortly before the book was released, it is also because everyone who fought for that justice died. Their bodies were broken and destroyed. This is the story of Eric Garner, of Michael Brown, of Tayvon Martin, and so many many more. It is true that their deaths have raised social consciousness but change is slow. A man was shot to death in Cincinnati as I write this. He failed to stop for a traffic infraction (he was missing his front license plate) which ended in him being shot in the head as he fled. He had been in trouble with the law but the fact that his body was so easily put at risk is a key part of the story. This is why the police buying the Charleston shooter a burger before booking is so outrageous or why pictures of Texas bikers sitting on the curb is so jarring. Social commentators may find it tempting to write of cultural dynamics, of family disruption, of black-on-black crime. But such arguments fail to address the basic fact that these dynamics of culture, family, and violence happen in other segments of society without death being such a likely outcome. They fail to consider how Coates himself is the product of educated, intact families, striving for economic success. They fail to address how Coates’ Howard University friend Prince Jones, the middle class son of a radiologist, could be shot dead at a traffic stop. If a highly articulate born-again leader like Prince would be seen as a body to be disposed of, what hope is there for a kid from Baltimore or Ferguson? What can Coates offer Samori except to learn to watch himself? Here’s his advice near the end of the book. Perhaps that was, is, the hope of the movement: to awaken the Dreamers, to rouse them to the facts of what their need to be white, to talk like they are white, to think that they are white, which is to think that they are beyond the design flaws of humanity, has done to the world. But you cannot arrange your life around them and the small chance of the Dreamers coming into consciousness. Our moment is too brief. Our bodies are too precious. And you are here now, and you must live— and there is so much out there to live for, not just in someone else’s country, but in your own home. I’ll be honest — this was a difficult read. It reminded me of how insulated and isolated my life is. But also of how I follow a Jesus who identified with those in need. Who worked for justice and righteousness bodily, including the sacrifice of his life at the whim of those in authority. Of how I should follow that path but so often fall short. I do not experience the bodily threat that Ta-Nehisi Coates so well articulates in this book. But I need to be reminded of it. To put myself in that place where I’m aware of risk of harm. Twitter seems to be in a state over the issue of #Blacklivesmatter or if we should say #Alllivesmatter. What Coates points out to me is that #Eachlifematters. Anything that puts that at risk must be confronted, especially by those of us who think we are white.